I went into this book with 0 expectations. I picked it up at a book swap and only because my Book Bestie had a copy and we agreed to buddy read it, so I didn’t even really read the synopsis. I must admit it did take me about 100 pages to get into the book and I only read about 15 pages before I decided to switch to audio. The reason for that mainly being that I’ve only been back at work for 2 week and I just could not read on a 7am train like normal. However it was the best decision I could have made because the narrator was fantastic! Although I think I may want this trilogy on my shelf I do think I will continue to listen to them. I am so glad this story was only told through Todd and I guess to an extent everyone elses noise, he was a really interesting character and it was amazing to watch him mature. When I first started the book and started to really get into it I couldn’t stop thinking about all the younger cousins I could gift my copy to. Todd was so relatable for his age group, that thirst to become a man already, never being a part of the big conversations and his struggle with that and also some of his initial reactions to things. but boy did he grow and mature, I honestly cannot wait to see how much more he develops in the next 2 books. Although I thought at first that Manchee and his constant “Poo, Todd” would end up driving me nuts he actually became my favourite character. I was kind of disappointed that we don’t know what bread he is (although I may have missed a description) but just from his character I am going with Golden Retriever. Loyal to a fault, a bit goofy and easily distracted. I have already told my Boyfriend that when we get our own place and our own dog he will be named Manchee, I am sure he will be best friends with our cat Church when we get him too. 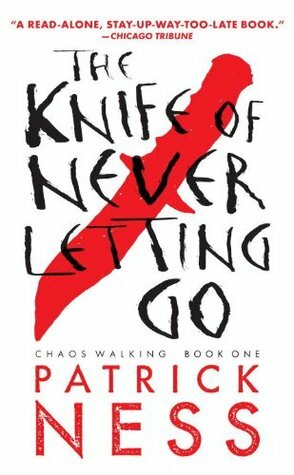 To keep everything no-spoilery as possible I would say The Knife of Never Letting Go explores what it really means to be courageous and the lengths we go to to protect our own. It looks at the root of evil and what happens when people abuse the power they are given and the extreme measures they take to keep that power when they are threatened. On top of all that it is an adventure packed SciFi novel with some really cleaver ideas. BUT the most important thing it makes you think about is what you would do in a world where everyone can hear your thoughts, seriously what in the world would you do? This review is super vague and I’ve done that on purpose because I actually think the less you know the easier it will be to slip into the story. 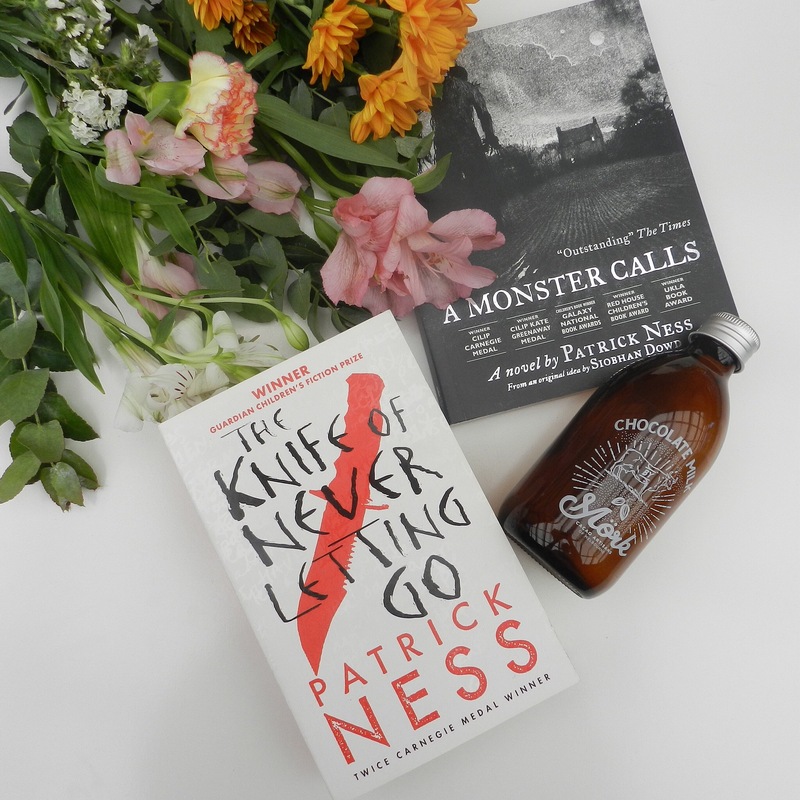 If you like ScifI, if you like adventure, if you like a good coming of age novel, if you are whiling to let this book take over your life for a little bit and give YOU ALL THE FEELS then really this is the book for you! I can’t wait to get to this book! I was supposed to read it this month but didn’t have time to! So it still sits on my shelf unread. Great review, I’m so excited to pick this up! Awesome review! I’m so glad you loved it too!!!! So glad you convinced me to pick it up at the book swap! Hahaha I will definitely do that!